Organisers hope that the possibility of rain will not stop up to 4,000 people from turning out to Shelf Gala tomorrow. 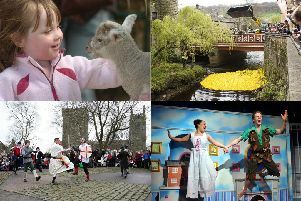 The event will feature 36 stalls, a fairground, and live music and performers throughout the day. The procession will leave the Shelf Industrial Site car park at 12.45pm and arrive at Shelf Hall Park at around 1.15pm. There will be performances from dance groups, a dog show and local schools will compete in a five-a-side football tournament. This year’s gala ambassador was named as Megan Harris. The gala will run from 1pm until around 5pm.